Have you experienced the benefits of an infrared sauna? Our sauna is a Far Infrared Thermal Therapy System, which heats your lower body and extremities keeping your heart and head cool. This action increases blood flow throughout the whole body without affecting your blood pressure. The Far Infrared Thermal Therapy System fixes the imbalance of heat in the body by warming the lower body, which increases blood flow to the whole body without raising blood pressure while the heart and head stay cool. Additionally, there have been positive results from research and studies about musculoskeletal conditions. Infrared energy relaxes the muscles, which reduces muscle spasms, relieves pain and heals fractures faster. Other conditions and discomforts were also remedied. 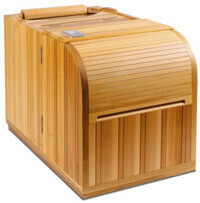 Would you like to learn more about whether you are a candidate for our infrared sauna? Contact Velocity Wellness Center today to schedule your visit.